Photo Reflection of the Day #112: #SelfieSunday #19; Or Here's the Face of an Idiot! So I got up at the crack of dawn (4:30am) to get ready and drive 1.5 hours to run a half-marathon in Maine. Unfortunately, that half-marathon was yesterday. Now, there is some explanation for my idiocy--I didn't just do this of no accord, but much of the problem came from not paying attention to details. I had originally signed up for a marathon for today back in March. I realized I wouldn't be ready for a marathon today and switched to the half-marathon they were offering a few weeks back. They said I was good to go and I never remembered to double-check the dates because the half-marathon was to be run on Saturday. I can only imagine what the folks at registration were thinking. I got back in my car, posted about it on Facebook--my idiocy--because I'm forever amused about such mistakes in my life. 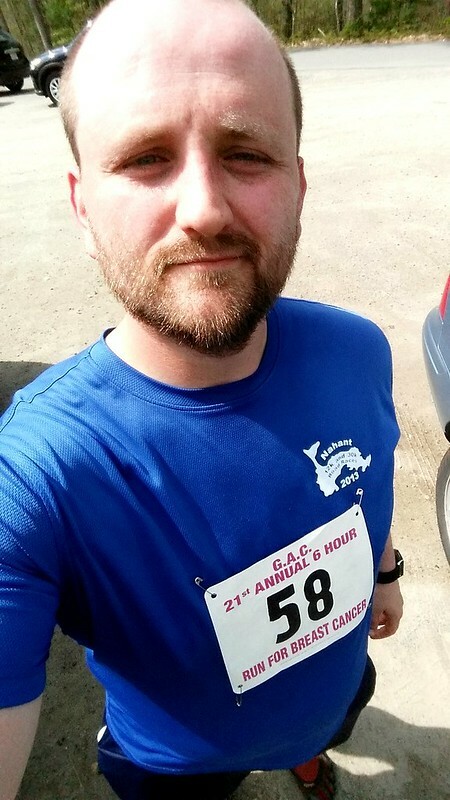 On the way home, I found out that a friend of mine was running a race near where I live that was just 3-mile loops for up to six hours. I was familiar with the place and figured I would go and sign up. I did and also met my friend there. I though that the race would be mostly pact gravel or even cement roads. Unfortunately, half the loop was rocky and rooted terrain which is really hard on the Vibrams. I made it 2 loops and called it a day. So yes, today, this selfie is of an idiot!